The government of Bihar, Revenue & Land Reforms Department has issued an official notification of 4950 vacant posts. Revenue & Land Reforms Department has invited online applications for the recruitment of Special Survey Amin posts. The application process is going to conclude tomorrow. Eligible candidates can apply online by visiting official website (lrc.bih.nic.in) before April 01, 2019. The applicants who are interested in the posts should check the complete eligibility criteria for more details. The candidates should read the complete advertisement to know the recruitment details like details of posts, age limit, important dates, application fee, educational qualification, selection process etc. 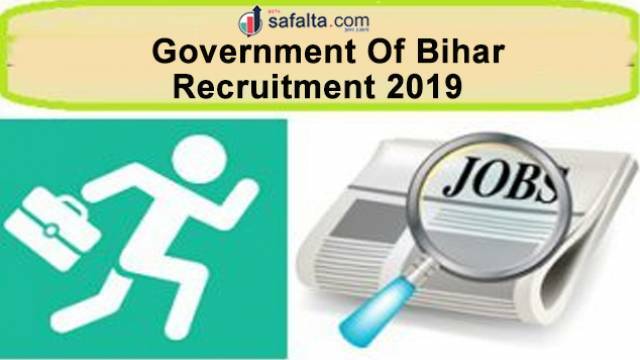 How to Apply For Bihar Revenue & Land Reforms Department Recruitment 2018: Eligible applicants may apply online through the official websites on or before the last date i.e April 01, 2019. Applicants should download the advertisement notification for more details. Regarding more latest updates on job alert, results and study material for the various exam, so keep an eye on Safalta education portal. Selection will be based on Merit. Application Fees: There is No Application Fee. Applicants should have completed Engineering Diploma in Civil Engineering from recognized University.